United faced the 1957-58 season without the player who had strolled like a colossus through the 1950抯 carrying the club on his broad shoulders. His transfer fee of �,000, and the proceeds from a visit from Juventus, soon disappeared. The new West Stand took care of half of the fee and �,000 was spent on Hugh Baird from Airdrie, charged with the hopeless task of replacing the Gentle Giant. He played his part scoring 20 goals in 39 appearances, gaining International honours with Scotland in the process, but United floundered to 17th with 37pts. The ever-dependable Eric Kerfoot was ever-present, and Wood, Dunn, Hair, Gibson/Ripley, Charlton, Meek, Crowe/Forrest, Baird, O払rien and Overfield were the regulars with Jimmy Ashall filling in at full-back when needed. Gerry Francis made one lone appearance, but became the first coloured player to play for Leeds. During the season United also bought two Irish Internationals. The inspirational Wilbur Cush, who cost �000 to secure him from Glenavon, arriving in November and Noel Peyton, who was signed for �000 from Shamrock Rovers to replace Harold Brook in February. Aging goalkeeper, Ted Burgin, after a long association with Sheffield United was added as cover for the goalkeeper spot when he joined from Doncaster Rovers. Frank McKenna, the former Bishop Auckland Amateur International Winger, after initial success as a centre-forward was allowed to leave. Veteran Harold Brook, after valuable service, went to Lincoln City and Reserve keeper Willie Nimmo departed for Doncaster Rovers. In the FA Cup United completed the unwanted treble, losing for the third year to, the now Second Division, Cardiff City. Unbelievable as it may seem, Round 3, Elland Road, 2-1 was the result each year! Raich Carter paid the price for one season of failure being replaced by Bill Lambton, at the season抯 end. The stalwart full back pairing of Jimmy Dunn and Grenville Hair, was parted as Jimmy was forced out with a knee injury. Jimmy Ashall proved a capable replacement. Eric Kerfoot also missed the majority of the season and with Hugh Baird returning to Scotland, sold for �,000 to Aberdeen, and United were without three of their major contributors in the previous season. This was compounded mid-season by the transfer-listing of keeper Royden Wood. 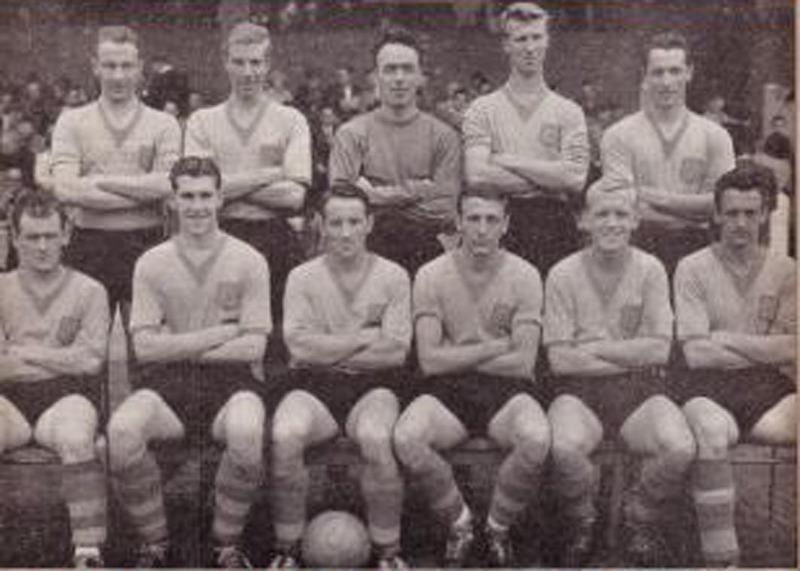 United bought winger Billy Humphries, to swell the Irish contingent, and centre-forward Alan Shackleton cost �000 from Burnley, who was to become a source of future strikers for United. Former regulars Jack Marsden, Bobby Forrest and Keith Ripley moved on and Ted Burgin became Wood抯 replacement. The most significant move, however, was the signing of Don Revie from Sunderland. The master-tactician, who even at 31, still commanded a fee of �,000, as events were to prove, it was money well spent. If the on-field disturbances were not enough, Lambton抯 unorthodox training methods were failing and when Grenville Hair and Jackie Overfield both put in transfer requests, in March, he was shown the door. Bob Roxburgh took over for the rest of the season. Alan Shackleton top-scored with 16 and there were healthy contributions from the young Chris Crowe (12) and Jackie Overfield (9). The team had an unsettled look as injuries and loss of form forced positional switches with the expected consequences, a lack of cohesion and a team struggling in both attack and defence with mid-table mediocrity the only likely outcome. Another season to forget! United amassed 39 pts to finish 15th. There was also humiliation in the FA Cup, trounced 5-1 at Luton Town, at the first hurdle. Jack Taylor was appointed Manager for the 1959-60 season. He bought midfielder Bobby Cameron from his old club, Queens Park Rangers. The departure of long serving stalwarts Jimmy Dunn and Eric Kerfoot was a sad loss, but age and injuries had taken their toll. Jimmy had played 443 times and could consider himself unlucky not to have played for Scotland. Eric had amassed 349 games and, like his predecessor, Tom Burden, had been a long-time inspirational Captain. Also leaving was George O払rien, who became a prolific marksman for a very successful Southampton. Irish International Right-Winger Billy Humphries, who had not been able to settle, returned to Ards. A promising young goalkeeper, Alan Humphreys, was bought from Shrewsbury Town for �000. York-born Schoolboy International John Hawksby was signed on, as was young Full-Back Alf Jones and Terry Caldwell was signed from Huddersfield Town as Full-Back cover. 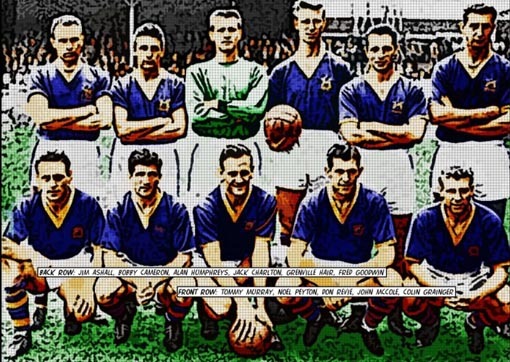 Injuries to Revie, Cameron, Cush, Overfield, Hair, Meek and Crowe at various stages of the season did not help nor did the sale of leading goal-scorer Alan Shackleton to Everton, after only two games. John McCole was bought for �,000 from Bradford City and with 22 goals from 33 games, he more than played his part. Chris Crowe gained under-23 honours for England, but this only fuelled his ambitions and after several months on the transfer list was sold to Blackburn for �,000. Powerful defender Freddie Goodwin was bought from Manchester United for �,000 with part of the proceeds from the Crowe sale. Leeds youth policy was starting to bear fruit and one W.J. Bremner emerged as a fresh faced ginger-haired right winger under the tutorship of the vastly experienced inside right Don Revie! At the heart of the defence Big Jack Charlton was maturing as the almost ever-present lynch-pin. In a season when the unexpected happened, United were relegated with 34 points in 21st place. They were only 21 points behind the champions! The Christmas fixtures brought Tottenham Hotspur, home and away. Having been beaten 4-2 at home, two days later United visited White Hart Lane, and, in front of a crowd of over 54,000, won 4-1. The significance of this to Tottenham was apparent, as they finished 3rd, two points behind the champions, with a better goal average! It was that kind of a season! John McCole (22) and Chris Crowe (11) led the goal-scorers, but again there was a very unsettled squad with 23 players getting the call. McCole was also United抯 only scorer in the FA Cup, which brought a 2-1 defeat at Aston Villa in the Third Round. 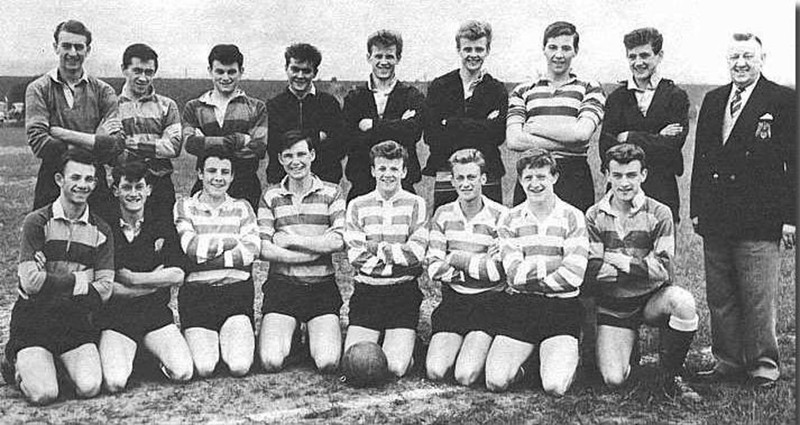 Money was tight but as 1960-61 season dawned there were nearly 50 boys, mostly from the local area, on amateur forms with the club.Although many fell by the wayside some broke through and took part in the club抯 tremendous revival in the mid-sixties. Unfortunately, for the present, life in Division 2 was no improvement as United抯 aging squad dropped deeper into the mire. Again injuries took their toll as United used 27 players. Revie only managed 14 appearances and Eric Smith 18. 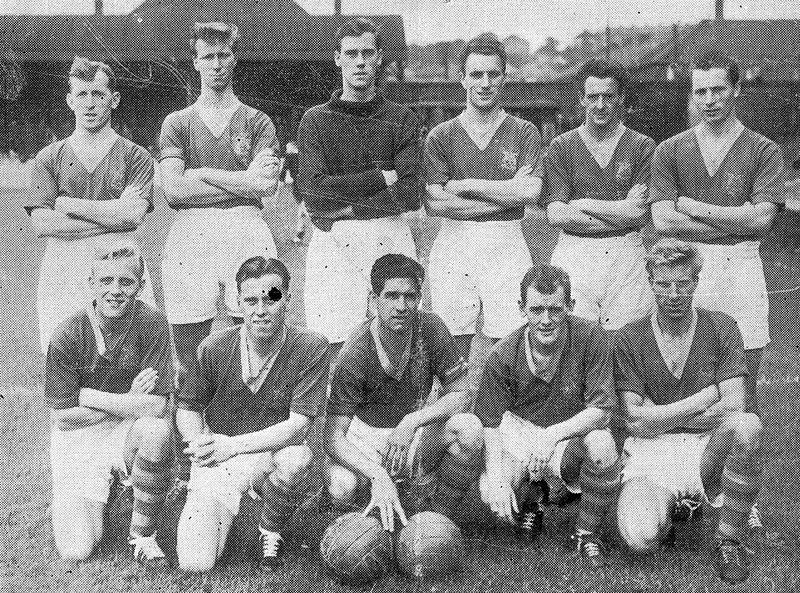 Smith had been bought from Glasgow Celtic for �,000 to replace the departed powerhouse Wilbur Cush.Jack McGugan, who was close to Scottish honours was signed from St Mirren for �,00 but could not oust Big Jack at centre-half, and after a solitary appearance was allowed to move on to Tranmere Rovers for �,000, a �000 loss the hard-strapped United could ill-afford. Winger Tommy Murray, a close-season �000 buy from Queen of the South, accompanied McGugan to Tranmere, but United broke even this time. Crooner and English International Colin Grainger, from Sunderland for �,000, arrived and Jackie Overfield departed in the opposite direction. Old Twinkle-toes, George Meek was sold to Leicester City for �000, but like his wing partner Harold Williams, often came back to Leeds at the end of his playing days. He continued to tie other past stars in knots until in his 50抯, as he starred for the Past-United players in charity games. Other acquisitions were Willie Bell from the Scottish Amateurs Queens Park and Irish International Peter Fitzgerald, while Norman Hunter was one of the promising youngsters signed. There were always goals aplenty whenever United played, 75 for and 83 against! John McCole again led the way with 20 from 35 appearances, a young Billy Bremner weighing in with 9 and Bobby Cameron 8. There was the customary Third Round exit in the FA Cup, this time Sheffield Wednesday were the victors 2-0 at Hillsborough. Another Cup Competition saw the light of day. It was to provide United with their first domestic honour - The Football League Cup. Joining the competition in Round Two, United held Blackpool goal-less at Bloomfield Road before scoring a 3-1 victory after extra-time at Elland Road. 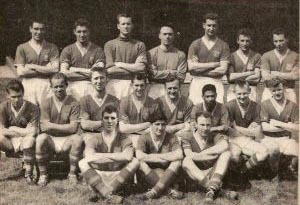 Chesterfield were thumped 4-0 at Saltergate in Round Three and just as United were getting delusions of grandeur they were rudely interrupted by Southampton who raced to a 4-0 lead at the Dell, with Derek Reeves getting all four. To their credit, United battled back to level 4-4 but with 25 seconds left Reeves scored his, and Southampton抯 fifth to claim an exciting victory. It was also the longest match in England as it did not finish until 10.10pm, due to two floodlight failures. To top off everything, in those days of no substitutes, both sides finished with ten men, with Southampton keeper Ron Reynolds and United full-back Alf Jones both going off injured. In March Harry Reynolds asked Jack Taylor to resign, and appointed Don Revie as Player/Manager. It is legend that Reynolds was writing a letter of recommendation for Revie in application for the vacant Bournemouth managerial position. He tore it up and recommended that Revie be put in charge at Elland Road. Understandably, with all the disruptions, United finished in 14th place with 38pts. In these days of sparse crowds and even sparser emergence of talent, came Albert Johanneson United抯 second coloured South African winger to provide entertainment for the last five games. A young 18 year-old John Hawksby was seen as a future star as he burst on the scene as an England Youth International, full of promise. 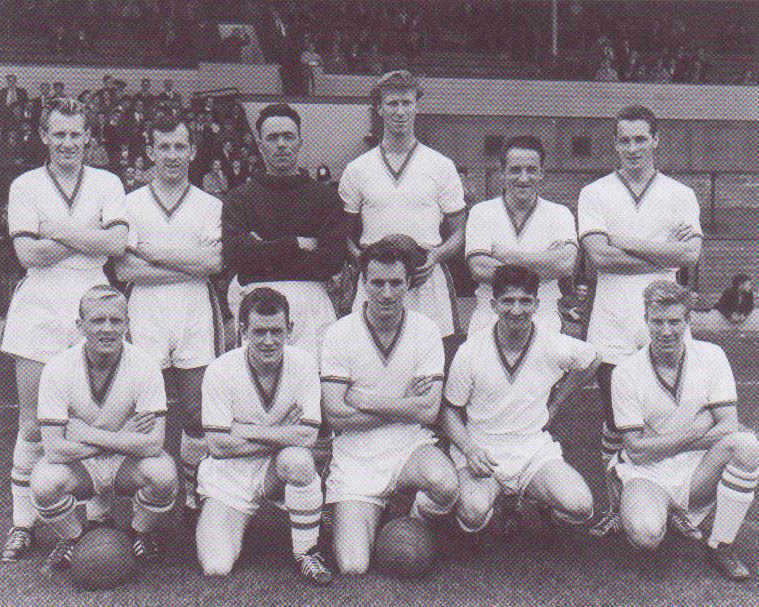 1961-62 opened with a mixture of Youth and experience. In goal was the England under-23 squad member Alan Humphreys. Eric Smith and Grenville Hair were an experienced pairing at full back. The experienced Bobby Cameron and Freddie Goodwin flanked a young Jack Charlton. New signing Derek Mayers, was on the right wing, as the young Billy Bremner moved inside. The prolific John McCole led the line with Noel Peyton partnering Albert Johanneson on the left. United were off to a flyer, winning the first two games, but a trip to Anfield brought them a return to earth with a 5-0 trouncing. 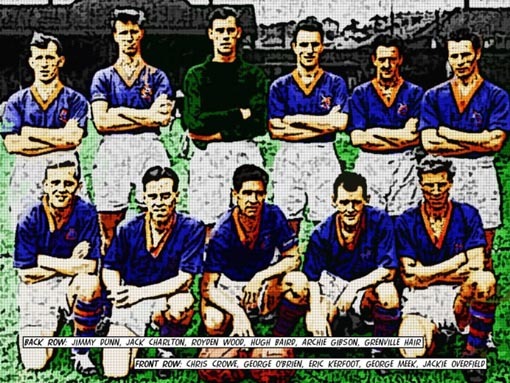 Scottish Amateur International Willie Bell came in on the left side of defence, Hair switched to right back, Eric Smith moved up to right half, Jack Charlton moved up to replace the departed John McCole and Freddie Goodwin took over at the centre of defence. 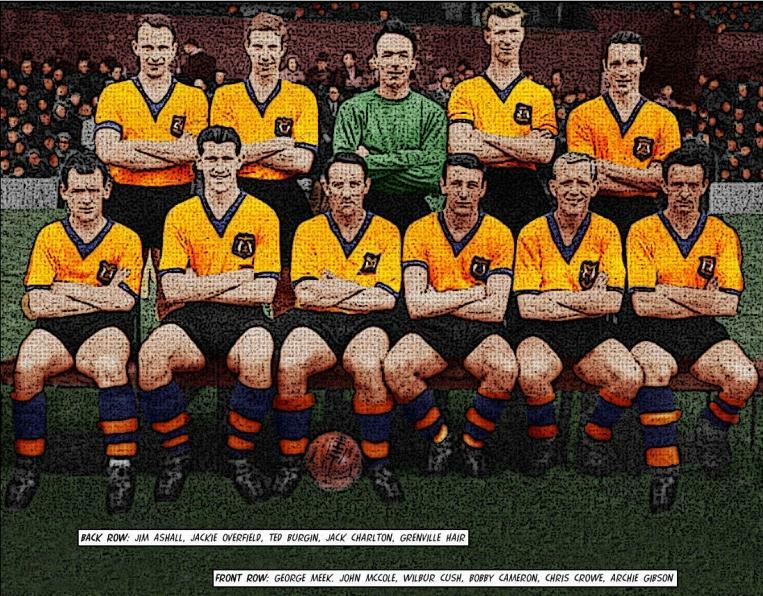 Completing the changes Tommy Younger, a vastly experienced Scottish International keeper was bought from Stoke City, John Hawksby replaced Albert Johanneson and Peter McConnell filled any vacancies in midfield. Only 4 of the next 18 matches were won as United plummeted. Only two more games were won in the next nine games, strangely against Champions, Liverpool and 3rd placed Sunderland! Desperate times demanded desperate measures. Revie, who had already bought former Manchester City playing colleague, and Irish striker, Billy McAdams from Bolton Wanderers for �,000, went for experience in his hour of need. He splashed �,000 on striker Ian Lawson from Burnley, �,000 on full back Cliff Mason from Sheffield United and �,000 on veteran Scottish International schemer Bobby Collins from Everton. With Leeds already reputed to be in debt to the tune of �0,000 it was an enormous risk spending so much money on the Wee General Collins, a brilliant inside forward in his day, but at 31, considered by many to be past his best. Fortunately, the gamble paid off as United lost only one fixture(a 4-1 defeat at Southampton, where a nervous, air sick Gary Sprake, was flown in at the last moment to replace the tonsillitis-stricken Tommy Younger) most were dour low-scoring draws, but a final day 3-0 victory at Newcastle was a welcome relief, as relegation was avoided by 3 points. United were 19th with 36 points. Harry Reynolds, reputed to be a self-made millionaire many times over, had become Chairman mid-season and Albert Morris and Manny Cousins, both successful business men joined John Bromley and Sidney Simon to form a new forward looking board. Lord Harewood was appointed President, a position he holds to this day. 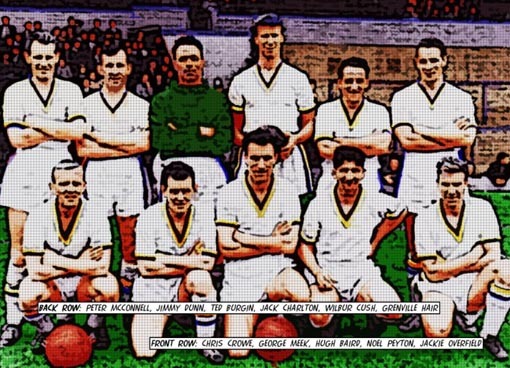 People laughed when Don Revie changed the Leeds official colours from the established 揃lue and Old Gold� to the 揂ll White� of Real Madrid, acknowledged dominant team in Europe, saying he wanted to emulate their achievements. There were derisive laughs and cat calls when Harry Reynolds made similar claims over the dilapidated Elland Road Tannoy system. Fortunately, the two men were serious and as proof, the directors put their money where their mouth was, finding the money to bring back John Charles for a record �,000 and a further �,650 for Airdrie抯 prolific scorer Jim Storrie. 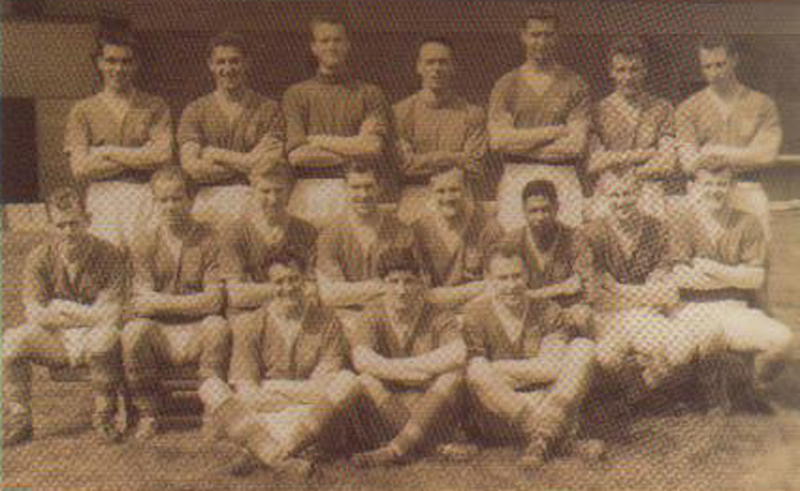 There was also a clear-out as Billy McAdams departed to Brentford for �000, Alf Jones joined Lincoln City for �000, Derek Mayers went to Bury for �000 and Bobby Cameron left for Non-League Gravesend & Northfleet while Peter McConnell was sold to Carlisle United for �000 and United kicked off the 1962-63 season with: Younger; Hair and Mason; Goodwin, Charlton and Smith; Bremner, Storrie, Charles, Collins and Johanneson. The Charles experiment did not have a fairy-tale end as he returned to Italy for a welcome �,000 (a handy �,000 profit) having scored 3 times in 11 games. The investment in 揇iamond� Jim Storrie paid a hefty dividend as he plundered 25 goals from 38 appearances. It was the Club抯 investment in their Youth scheme that also paid dividends. After a faltering start to the campaign, in which only two of the first six games were won, Revie took the chance on youth. 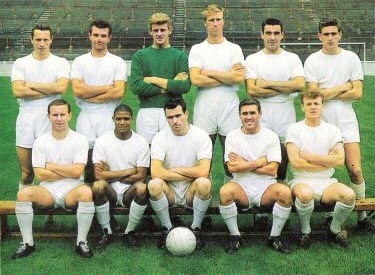 In the seventh game, at Swansea, Revie called up Sprake, Reaney, Hunter, and forward Rod Johnson from the Youth team and recalled Noel Peyton. Johnson and Bremner scored to give United a 2-0 victory. 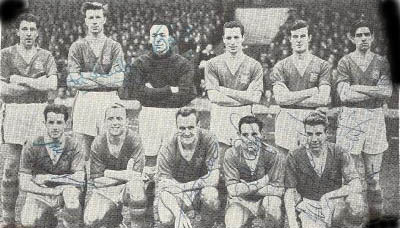 The moves were caused partly by injuries to Goodwin and Smith, but with Willie Bell coming in at right half and Billy Bremner抯 Scottish Schoolboy colleague Tommy Henderson partnering him on the right flank, the team took on a more familiar look: Sprake; Reaney, Hair/Mason; Bell, Charlton, Hunter; Henderson, Bremner, Storrie, Collins and Johanneson. There were also a couple of appearances for other youngsters, Mick Addy, a 15 year and 289 days old Peter Lorimer, Barrie Wright and Jimmy Greenhoff. The fleet-footed Don Weston was signed from Rotherham United for �500 and heralded his mid-season arrival with a debut hat-trick as United joined the front runners. United even ended a nine-year drought in the FA Cup when they beat Stoke City 3-1, on 6th March, in a many times postponed tie which was common place in one of the worst winters on record. Ten days later they won at Middlesbrough 2-0 but fell 3 days later 3-0 at Nottingham Forest in the 5th Round. In the League United scored 79 goals, 25 to Storrie, 13 to Johanneson, 10 to Bremner, 8 from Collins and 7 from Don Weston. They lived to regret their poor start, as they missed promotion by 4 points. Finishing 5th with 48 pts, but with future stars Cooper and Madeley already in the Youth team, United were looking to the future with anticipation. Back Row: Jack Charlton, Bob Forrest, Jimmy Dunn, Royden Wood, Grenville Hair, Hugh Baird. Front Row: George Meek, Wilbur Cush, Eric Kerfoot, Noel Peyton, Jackie Overfield. 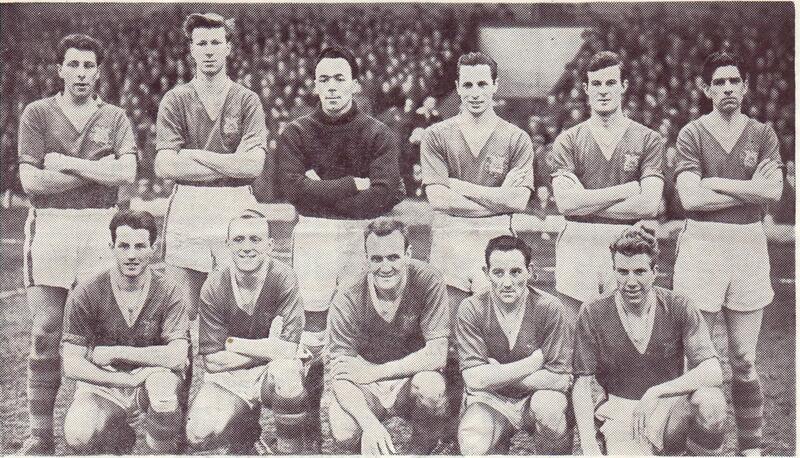 Back Row: Jimmy Dunn, Jack Charlton, Royden Wood, Grenville Hair, Bob Forrest. Front Row: George Meek, George O'Brien, Eric Kerfoot, Hugh Baird, Archie Gibson, Jackie Overfield. Back Row: Jack Charlton, Jimmy Dunn, Royden Wood, Grenville Hair, Archie Gibson, Hugh Baird. Front Row: Chris Crowe, George O'Brien, Eric Kerfoot, George Meek, Jackie Overfield. Back Row: Jimmy Dunn, Jack Charlton, Royden Wood, Hugh Baird, Archie Gibson, Grenville Hair. 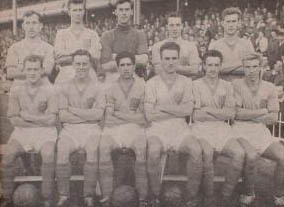 Back Row: Standing: Unknown #1, David Jones, Unknown #2, Unknown #3, Unknown #4, Eric Kerfoot, Jimmy Ashall, Royden Wood, Peter McConnell, Jack Marsden, Willie Nimmo, Unknown #5, Hugh Baird, Bill Lambton (Manager). Middle Row: Kneeling: Billy Bremner, Tom Hallett, John Kemp, Gerry Francis, Roy Ambler, Unknown #6, Terry Carling, Jack Charlton, Jimmy Dunn, Archie Gibson. 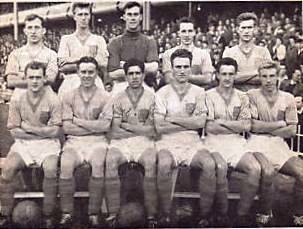 Front Row: Sitting: Tommy Henderson, Tony Leighton, Jackie Overfield, George Meek, Grenville Hair, Keith Ripley, Bob Forrest, Wilbur Cush, Noel Peyton. Absent on Army National Service: Chris Crowe, George O'Brien. 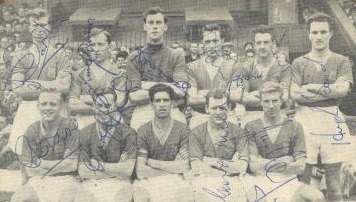 Back Row: Peter McConnell, Jimmy Dunn, Ted Burgin, Jack Charlton, Wilbur Cush, Grenville Hair. Front Row: Chris Crowe, George Meek, Hugh Baird, Noel Peyton, Jackie Overfield. Back Row: Bill Lambton (Manager), Bob Forrest, Jimmy Dunn, Jack Charlton, Royden Wood, Grenville Hair, Archie Gibson, Ivor Powell (Trainer). Front Row: Chris Crowe, Noel Peyton, Wilbur Cush, George O'Brien, Jackie Overfield. Back Row: Jim Ashall, Archie Gibson, Royden Wood, Jack Charlton, Grenville Hair. Front Row: Billy Humphries, Chris Crowe, Don Revie, Wilbur Cush, Alan Shackleton, Jackie Overfield. 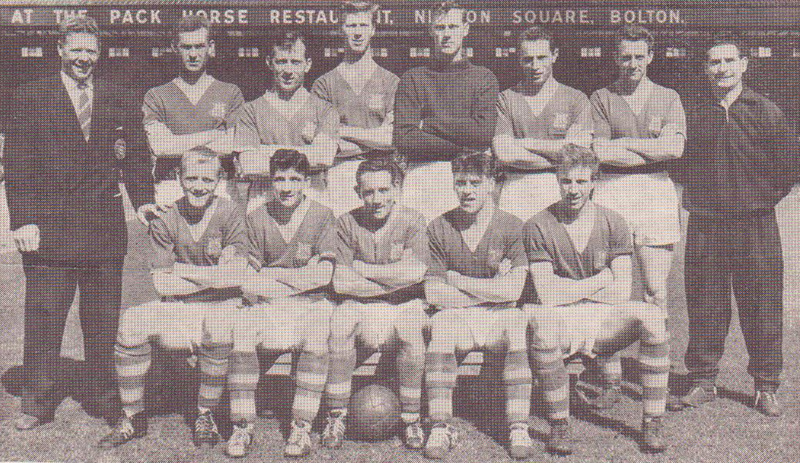 Back Row: Ron Mitchell, Jack Charlton, Ted Burgin, Grenville Hair, Alan Shackleton, Eric Kerfoot. Front Row: Billy Humphries, Chris Crowe, Don Revie, Wilbur Cush, Jackie Overfield. 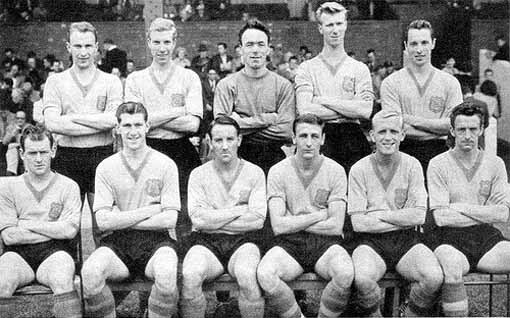 Back Row: Jack Charlton, John Kilford, Jackie Overfield, Peter McConnell, Ted Burgin, Jim Ashall, Alan Shackleton, Bobby Cameron, Don Revie. Front Row: Billy Humphries, Grenville Hair, Wilbur Cush, Chris Crowe, George Meek, Archie Gibson, Noel Peyton. Back Row: Jim Ashall, Jackie Overfield, Ted Burgin, Jack Charlton, Grenville Hair. Front Row: George Meek. John McCole, Wilbur Cush, Bobby Cameron, Chris Crowe, Archie Gibson. 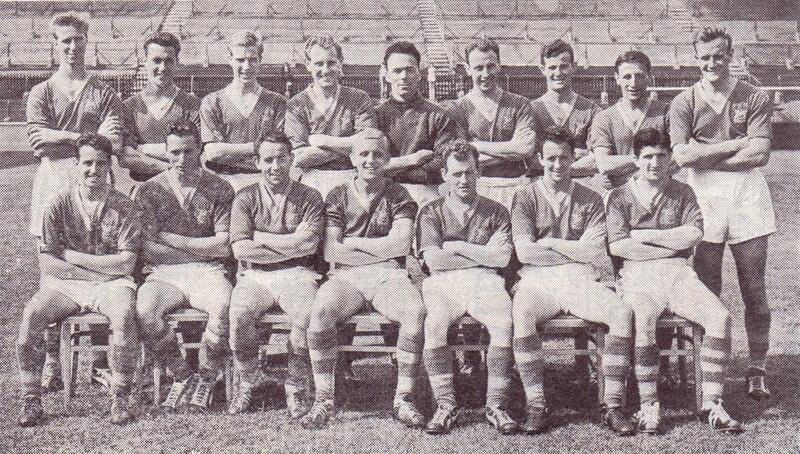 Back Row: John Kilford, Terry Caldwell, Alan Humphreys, Ted Burgin, Fred Goodwin, Bobby Cameron, Grenville Hair. 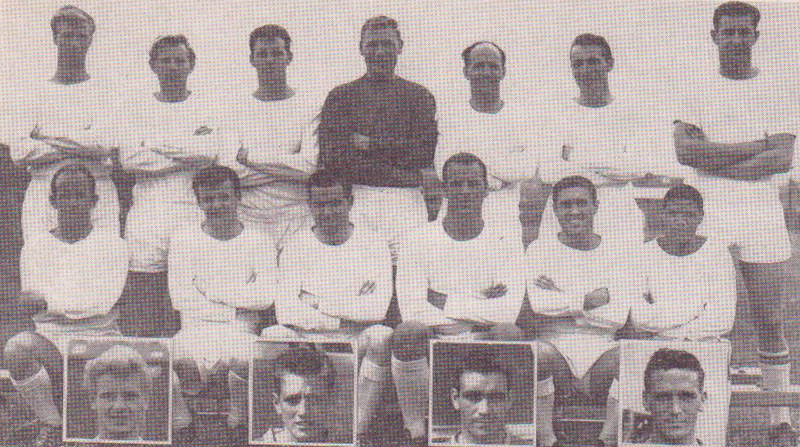 Middle Row: George Meek, Eric Smith, Jackie Overfield, John McCole, Don Revie, Gerry Francis, Peter McConnell, Billy Bremner. Front Row: Archie Gibson, Noel Peyton, Jim Ashall. 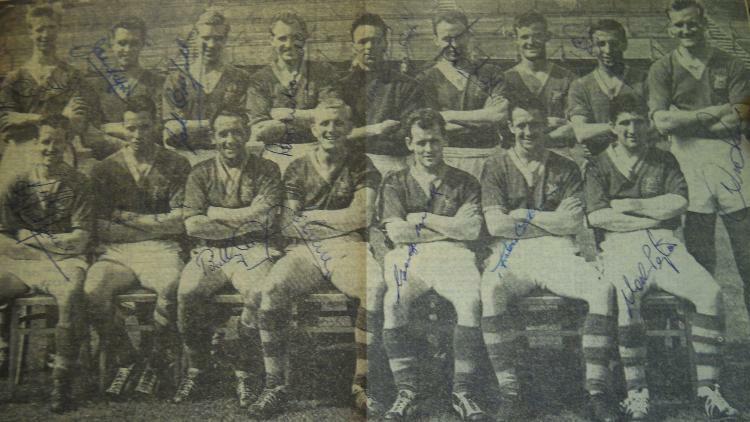 Back Row: Willie Bell, Terry Caldwell, Alan Humphreys, Ted Burgin, Fred Goodwin, Bobby Cameron, Grenville Hair. Middle Row: Ronnie Wright, Eric Smith, Jack Charlton, John McCole, Don Revie, Gerry Francis, Peter McConnell, Billy Bremner. Front Row: Colin Grainger, Noel Peyton, Jim Ashall. Back Row: Jim Ashall, Bobby Cameron, Alan Humphreys, Jack Charlton, Grenville Hair, Fred Goodwin. Front Row: Tommy Murray, Noel Peyton, Don Revie, John McCole, Colin Grainger. 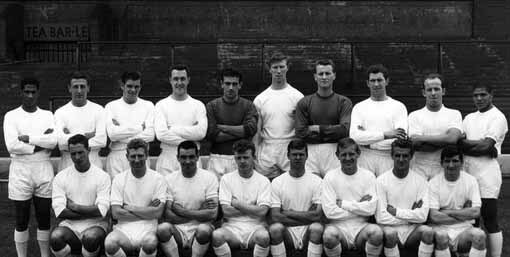 Back Row: Billy Bremner, Terry Caldwell, Grenville Hair, Peter Fitzgerald, John Hawksby, Alan Humphreys, Bobby Cameron, Eric Smith, Don Revie. Front Row: Alf Jones, John McCole, Jack Charlton, Fred Goodwin, Jackie McGugan, Gerry Francis, Colin Grainger. Back Row: D. Roper, P.Cooney, Ronnie Blackburn, Terry Cooper, Peter Metcalfe, Mick Addy, Eric Thompson, Norman Hunter, Harry Reynolds. 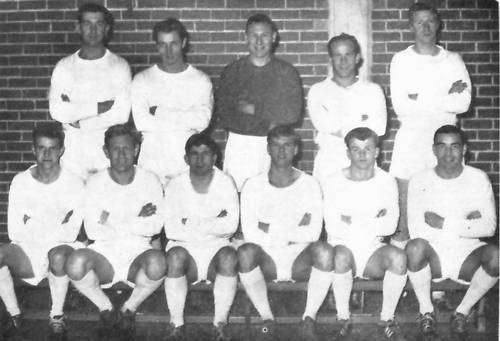 Front Row: Paul Reaney, D. Schofield, S. Silverwood, T. Lloyd, Billy Bremner, Hugh Ryden, Terry Casey, Rod Johnson. Back Row: Fred Goodwin, Grenville Hair, Tommy Younger, Eric Smith, Jack Charlton. 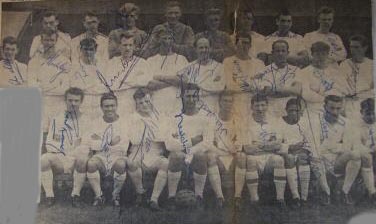 Front Row: Derek Mayers, Peter McConnell, Noel Peyton, John Hawksby, Billy Bremner, Willie Bell. Back Row: Norman Hunter, Mike Addy, Gary Sprake, Terry Carling, Alan Humphreys, Grenville Hair, Terry Cooper, Barry Wright. 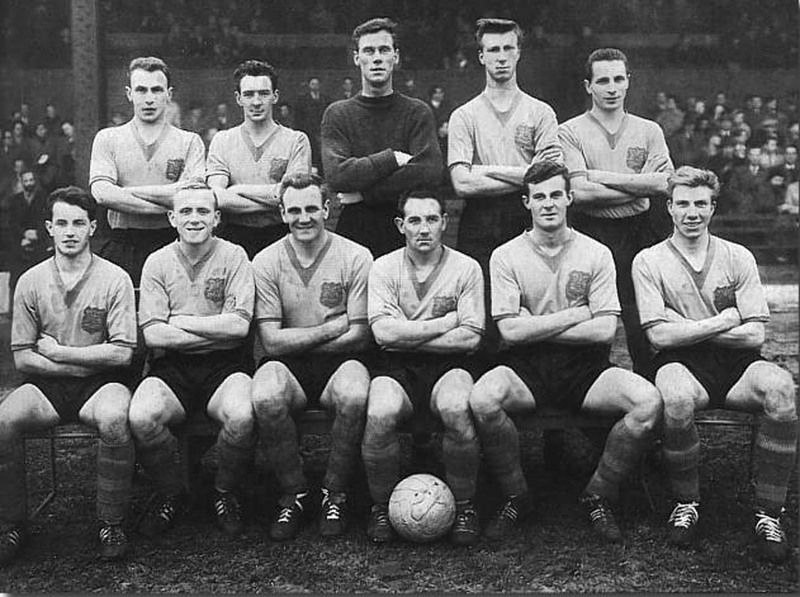 Middle Row: Alf Jones, Bobby Cameron, Eric Thompson, Peter Metcalf, Paul Reaney, Tom Hallett, Willie Bell, John Kilford, Eric Smith, Hugh Ryden, Albert Johanneson, Noel Peyton, Gerry Francis. Front Row: Rod Johnson, Terry Casey, Derek Mayers, Fred Goodwin, Jack Charlton, Peter McConnell, Billy Bremner, John Hawksby, Colin Grainger. Back Row: Gerry Francis, Bobby Cameron, Alf Jones, John Kilford, Terry Carling, Jack Charlton, Alan Humphreys, John McCole, Eric Smith, Albert Johanneson. 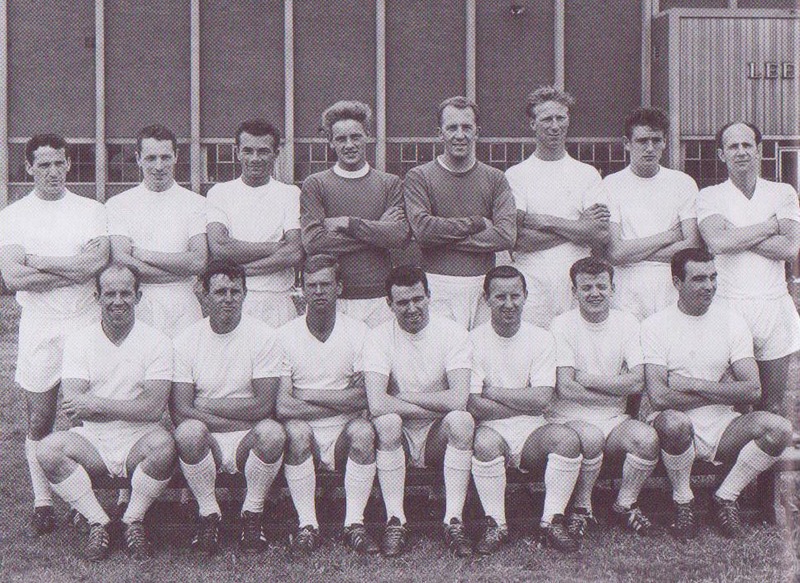 Middle Row: Grenville Hair, Colin Grainger, Willie Bell, Billy Bremner, John Hawksby, Peter McConnell, Derek Mayers, Noel Peyton. 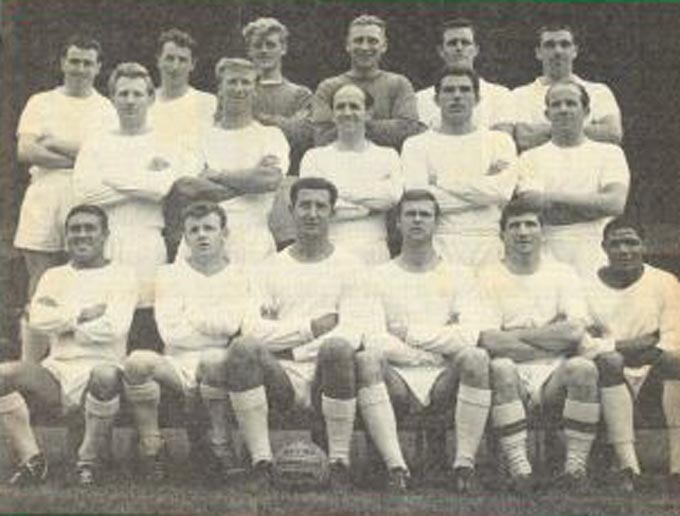 Back Row: Syd Owen (Coach), Les Cocker (Trainer), John Hawksby, Alan Humphreys, John Kilford,Jack Charlton, Eric Thompson, Mike Addy, Gary Sprake, Peter Metcalf, Paul Reaney, Rod Johnson, Bob English (Physio), Don Revie (Manager). Middle Row: Billy Bremner, Gerry Francis, Derek Mayers, Eric Smith, Tom Hallett, Terry Carling, Albert Johanneson, Willie Bell. 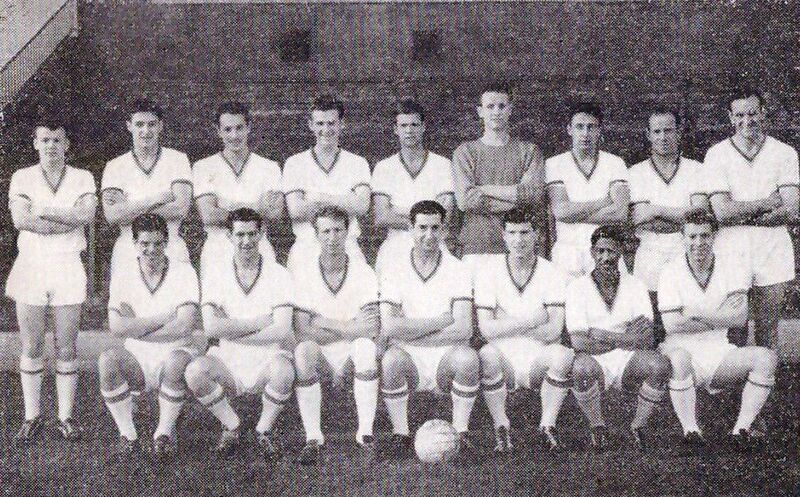 Front Row: Norman Hunter, Terry Casey, Grenville Hair, Alf Jones, Hugh Ryden, John McCole, Bobby Cameron, Colin Grainger, Noel Peyton, Peter McConnell, Terry Cooper. Back Row: John Dickson, ?1, Nicholson, Nigel Davey, ?2, Derek Ryder. Front Row: ?3, ?4, Dennis Hawkins, Mick Bates, Terry Hibbitt. Back Row: Cliff Mason, Jack Charlton, Tommy Younger, John Charles, Grenville Hair, Eric Smith. Front Row: Billy Bremner, Jim Storrie, Fred Goodwin, Bobby Collins, John Hawksby, Albert Johanesson. Back Row: Jack Charlton, Peter McConnell, Ian Lawson, Tommy Younger, Cliff Mason, Grenville Hair, Fred Goodwin. Front Row: Eric Smith, Billy Bremner, Jim Storrie, John Charles, Bobby Collins, Albert Johanesson. Inset: Gary Sprake, Norman Hunter, Willie Bell, Don Weston. 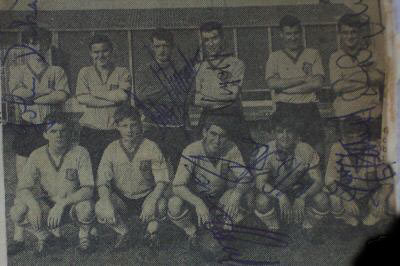 Back Row: Jim Storrie, Grenville Hair, Gary Sprake, Tommy Younger, Ian Lawson, Willie Bell. 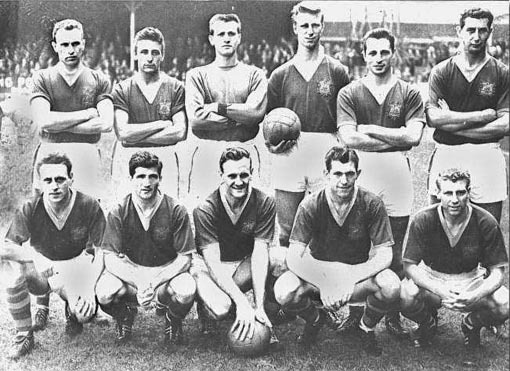 Middle Row: Peter McConnell, Jack Charlton, Cliff Mason, Tom Hallett, Eric Smith. 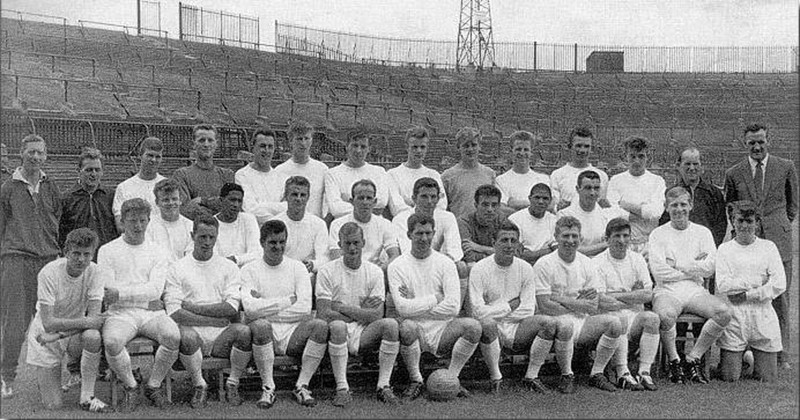 Front Row: Bobby Collins, Billy Bremner, Freddie Goodwin, John Hawksby, Noel Peyton, Albert Johanneson. Back Row: Ian Lawson, Gary Sprake, Grenville Hair, Cliff Mason, Willie Bell, Eric Smith. 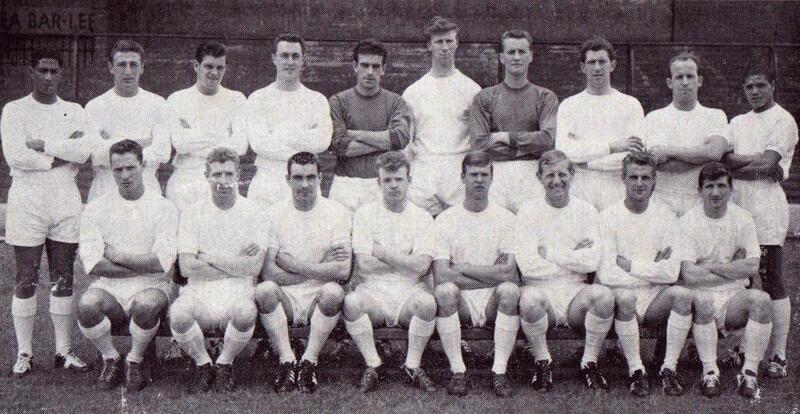 Front Row: Bobby Collins, Billy Bremner, Jack Charlton, John Hawksby, Jim Storrie, Albert Johanesson. 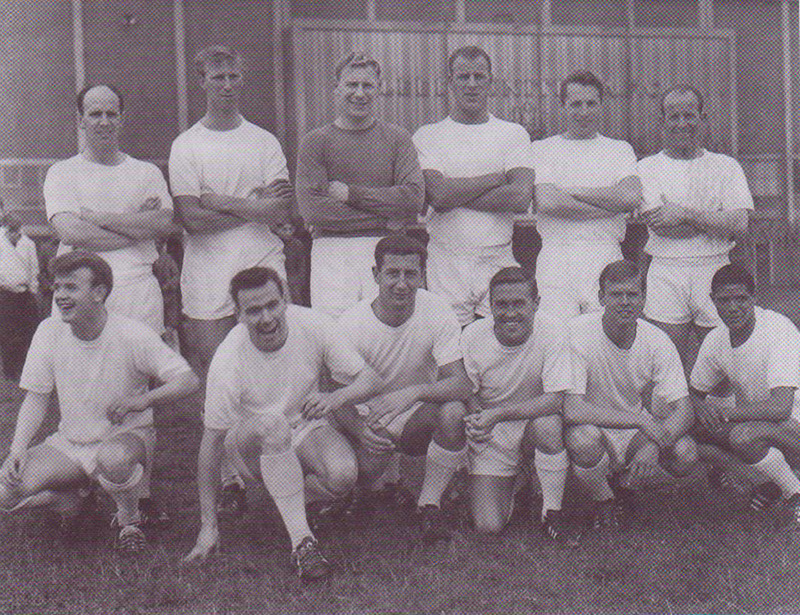 Back Row: Grenville Hair, Paul Reaney, Gary Sprake,Jack Charlton, Willie Bell, Norman Hunter. Front Row: Tommy Henderson, Albert Johanesson, Jim Storrie, Bobby Collins, Billy Bremner. 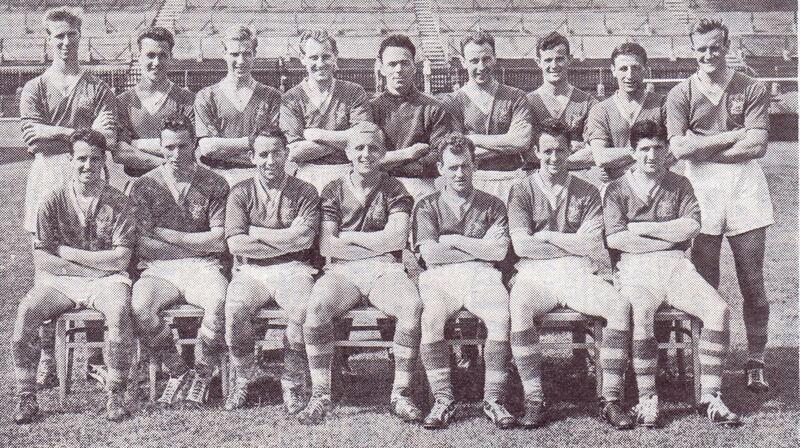 Back Row: Jim Storrie, Grenville Hair, Gary Sprake, Tommy Younger, Hayden Hough, Ian Lawson, Willie Bell, Mike Addy. 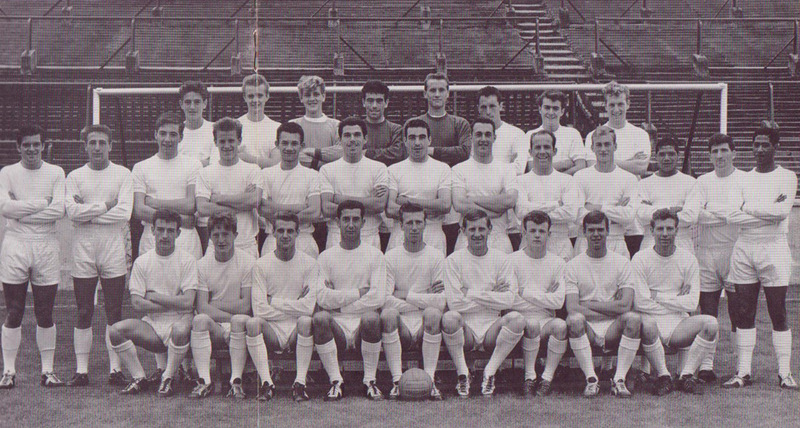 Middle Row: Clive Middlemass, Paul Madeley, Terry Cooper, Peter McConnell, Jack Charlton, Cliff Mason, Tom Hallett, Eric Smith, Terry Casey, Norman Hunter. Front Row: Paul Reaney, Bobby Collins, Billy Bremner, Freddie Goodwin, John Hawksby, Noel Peyton, Albert Johanneson, Rod Johnson, Terry Hibbitt. Bill Lambton (Manager), Jack Taylor (Manager),Don Revie (Manager), Mike Addy , Jimmy Ashall , Hugh Baird , Willie Bell , Billy Bremner , Harold Brook , Ted Burgin , Terry Caldwell , Bobby Cameron , Terry Carling , Terry Casey , John Charles , Jack Charlton , Bobby Collins , Chris Crowe , Wilbur Cush , Jimmy Dunn , Peter Fitzgerald , Bob Forrest , Gerry Francis , Archie Gibson , Freddie Goodwin , Colin Grainger , Jimmy Greenhoff , Grenville Hair , Tom Hallett , John Hawksby , Tommy Henderson , Alan Humphreys , Billy Humphries , Norman Hunter , Albert Johanneson , Rod Johnson , Alf Jones , John Kemp , Eric Kerfoot , John Kilford , Ian Lawson , Peter Lorimer , Jack Marsden , Geoff Martin , Cliff Mason , Derek Mayers , Billy McAdams , John McCole , Peter McConnell , Jackie McGugan , George Meek , Ron Mitchell , Tommy Murray , Willie Nimmo , George O'Brien , Jackie Overfield , Noel Peyton , Paul Reaney , Don Revie , Keith Ripley , Alan Shackleton , Eric Smith , Gary Sprake , Jim Storrie , Don Weston , Brian Williamson , Royden Wood , Barrie Wright , Ronnie Wright , Tommy Younger .